In 2017 I was invited to speak as part of the University of Cambridge‘s Curious Objects exhibition, in celebration of the Library’s 600th anniversary. Within their collections, they hold an eclectic range of objects, from an ostrich feather and ectoplasm to an old boot, a boomerang, and beard hair sent to Charles Darwin. The objects in their archives came from all corners of the world and span every era of human history from the Stone Age to the Space Age. All of these ‘curious objects’ have a part to play in telling the story of the University Library in its 600th anniversary year, a story told not through its printed and manuscript treasures, but through a cabinet of curiosities that opens a window onto the nature of collecting, private and institutional. Shabby and beautiful, quirky and controversial, they provoke our curiosity and prompt questions about the nature of the Library—past, present and future. Collecting and curating is at the heart of my own creative practice and I am always inspired by the different objects that find themselves into display cabinets. Back in 2017, I had been researching echinoids, having found one of these beguiling fossilised sea urchins on the Thames Foreshore, which had led me to discover the work of Dr Ken McNamara. 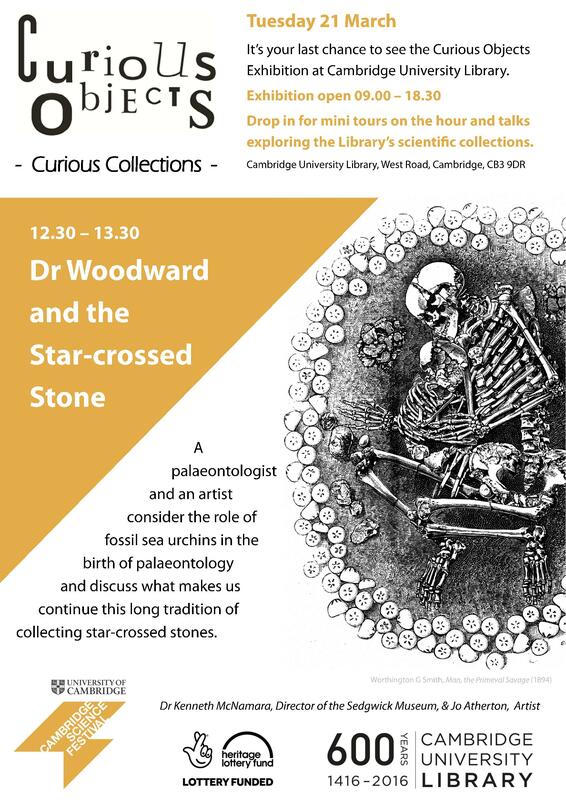 He has researched the fascinating history of these star crossed stones which were collected by the very earliest humans. Some of these treasured fossils were displayed for Curious Objects and it was a delight to be invited to present my own work and research alongside Ken on the closing day of the exhibition in Cambridge. Speaking to an academic audience was an opportunity to focus on my process and research, rather than the end result of my finished creative work, as is so often the case with artists. The very activity I indulge in as a means of looking closely, gathering and organising informs my visual art but the process leading up to this is equally fascinating, holding much overlap with archaeology, geology and even palaeontology where a slowing down and close examination of the world furthers our understanding of the world, and I would argue, as is my case walking the tideline, ourselves.